We were blessed with another beautiful day on our arrival to our 2nd port in the southern Caribbean — Tortola. Tortola is east of Puerto Rico and is approximately 12 miles long and 3 miles wide. Population is approximately 24,000. It is not a very populated island. The island has a tropical feel with high temperatures between 84-89° Fahrenheit. English is the spoken language and they use the U.S. dollar for currency. On this day, we had reserved a very unique excursion — swimming with a dolphin. Sounds exotic doesn’t it? When we left the ship we were met at the pier by a guide who held up a sign that said “Dolphin.” A local “shuttle” was waiting for us. I had a little difficulty getting onto the shuttle as the first step was pretty high. With help from my family I was finally on board. 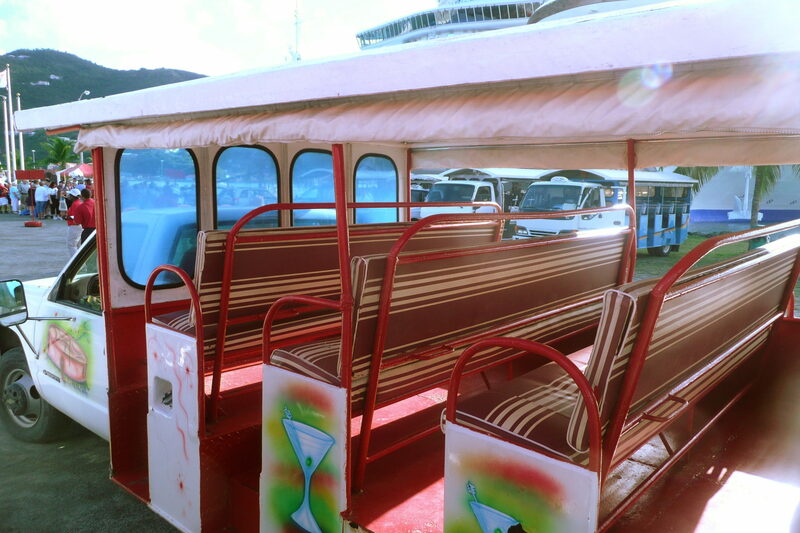 The shuttle ride to Prospect Reef Port where we would swim with the dolphins was about 15 minutes. 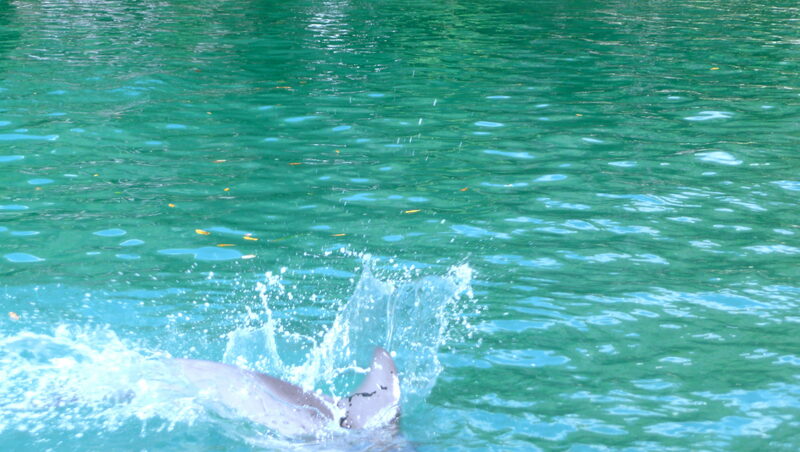 The port has 2 lagoons that contain the dolphins who have been here for a few years and are specially trained. Once we arrived, we were directed to remove everything from our persons except our swimming suits (shoes included) and put our belongings in cubby holes. Then we were given life jackets and sat down to watch a video on what to expect along with safety rules for us and the dolphins. Each group was assigned a letter. After the video, the guide said “All those with the letter E please follow me. You will be riding with the dolphins.” We were excited since we had the letter E. Unfortunately, a woman in another group was heard complaining rather loudly. She was not in our group but thought she had paid to “ride” with the dolphins. The guide told her she would have to take the matter up with the cruise line as she had not paid for the extra bonus of “riding.” I felt sorry for her as she had been all excited and now was disappointed. I feel the company should have offered to take an extra payment to accommodate her. As we were heading to the lagoons, a photographer was taking group pictures. We declined. She was quite insistent that she wanted to take our picture and I was quite insistent that she not take it. 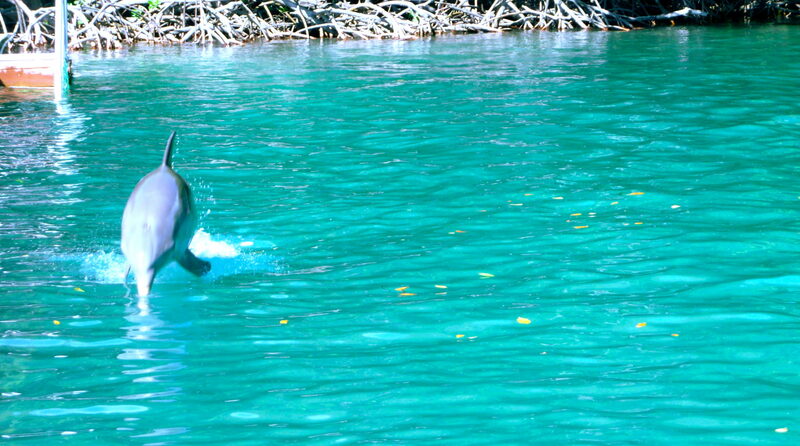 As we walked down a boardwalk next to the lagoons, we saw a dolphin jump out of the water. From the video we watched, we knew what to expect but the anticipation was compelling. One by one each person in our group headed into the water. On the side of the lagoon there was a 3 foot platform where you could stand. 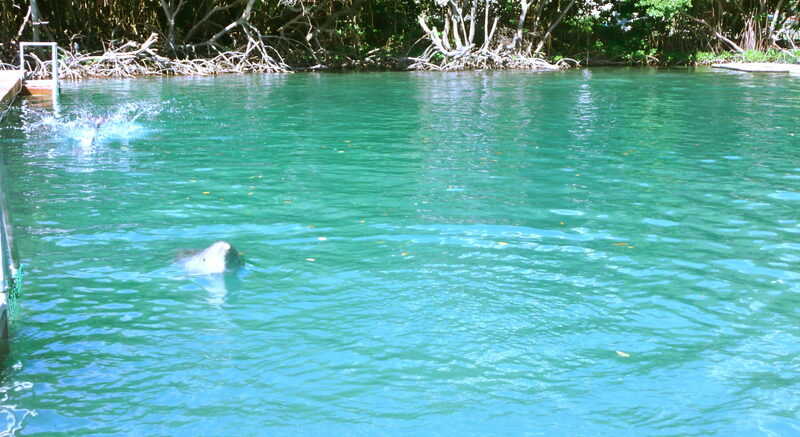 The guide had the first person swim out to the middle of the lagoon. He threw a fish into the water near them. We were directed to put our left hand on our chest and to hold our right hand to the side and in the water. The dolphin came around each person and when he swam under your right arm you were supposed to reach for his fin, hang on and then reach for his other fin. He would then glide you over to the other side of the lagoon. When you let go of the dolphin’s fin, we were shown how to make the dolphin play with us. Then we could kiss the dolphin. I watched as the first 4 people went through. Everything went smoothly. Then it was my turn. I swam to the middle of the lagoon. All of a sudden I was on my back. Not good. The life jacket had not been properly pulled tight on me so I was having a hard time “standing” in the water. The guide threw the fish but since my feet were flailing the dolphin just passed me by. They don’t know what to do when the “right” steps aren’t followed. The guide yelled at me to stand still and straight. I tried pulling my life jacket down but the back (which should have been on my neck) was still up on my head. Finally I was able to get it down. Here came the dolphin. I grabbed his fin with my right hand. Got it! Then I reached for his other fin with my left hand. Got it! I felt giddy. When we reached the guide at the other end I let go. The guide then said “Since you are having problems swimming we’ll just have you stand on the ledge here.” It wasn’t my fault! I felt like screaming. Instead, I was able to play with the dolphin for another 5 minutes. All of this was photographed. After each person in our group went through the same steps, we all swam out to the middle of the lagoon. There we clapped our hands in the water and the dolphin swam and jumped around us. Then it was over. We had swum with a dolphin. Getting out of the water, the photographer again tried to take our picture. Again we said no. She insisted. I told her no. It wasn’t until later that I understood why she was so insistent. Across from the lagoons is a building where you can go and look at the pictures that they have taken. They offer you a “package” deal. Of course, if they don’t take all the pictures then the package deal kind’ve falls by the wayside. They wanted $25 per photo (4×6’s I believe) or $159 for the package deal since we were a family of four. I thought it was absurd. We paid $169 per person for this “once in a lifetime” experience and that should have come with something. The photographer then told another woman, in Spanish, that she would take care of me because I had “issues” with her. She continued trying to sell us the package. Again I told her no and we walked away. Quite an experience. I should have told her I knew what she said. I didn’t have issues with her. We simply didn’t want our pictures taken. And, of course, they wouldn’t allow us to take a camera with us. Oh well … at least we swam with the dolphins. Again we just relaxed in a chair and read. The nice thing about cruises is that you can be as busy or lazy as you want to be. After our 5:30 p.m. dinner, we went to the Princess Theatre for the entertainment of the evening. A comedian by the name of Carlos Oscar was performing. He was really good. I liked that he did not use profanity during his show. Afterwards, he alluded to the fact that “one does not have to use profanity for a show to be good.” He was right. Back in the cabin, the chocolates were laid out on the bed. 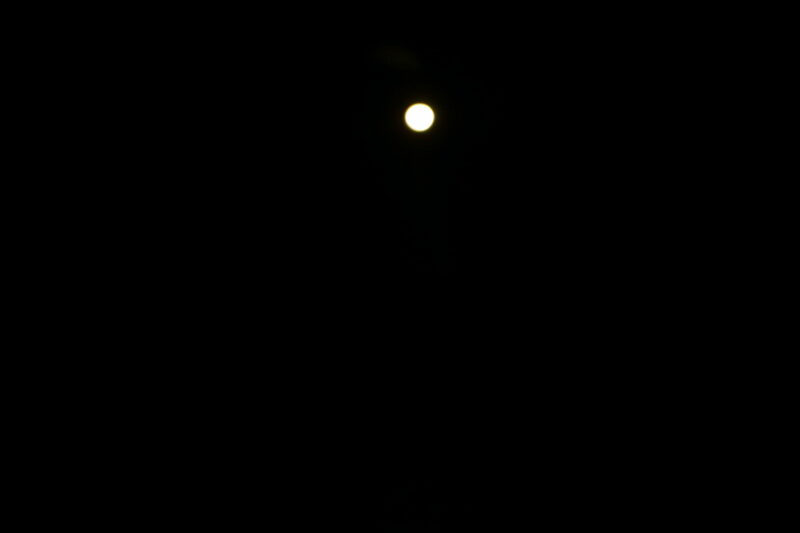 The moon was full tonight. It was so peaceful and I was glad we had a balcony. Sleep would come quickly again as the slow swaying of the ship lulled me to sleep. Day 3 was now completed. she swims with the fishes.